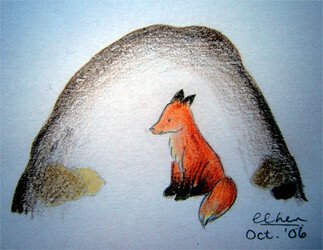 Once upon a time, there was a little red fox named Zorro who lived with his mum, dad and nine brothers and sisters in a cozy den in the ground. Although they were all born in the spring, Zorro was the youngest and smallest kit of the litter. He was very unsteady on his feet. He would often trip over his own slender black legs or accidentally step on his own white-tipped tail. Zorro was often teased by his siblings – his brothers pulled his little bushy tail and his sisters poked his little brown nose. Zorro tolerated their antics. After all, they were all cross fox (with black patches of fur along the back and shoulders) and were only jealous of his beautiful orange coat. One day, his mother said to them, "Children, when autumn arrives, it will be time for you to find and mark your own territory." All summer long, Zorro frolicked in the brush with his brothers and sisters, eating fruit and insects, and eggs whenever he could find them. Every day, his sisters woke him up at dusk and they romped and played in the long grasses. Since fox are most vulnerable as kits, Zorro was requested to stay close to the entrance of the den. Zorro was allowed to stay up earlier and earlier in the morning and very soon, he could stay up until dawn like all the other adult fox. Within ten months, Zorro grew up to be a graceful fox. He was adept at hunting because he had excellent eyesight. Like all other fox, Zorro had yellow eyes with narrow pupils like a cat's. One day, when he began to moult and grow a thicker layer of fur, he knew it was time to go. He remembered what his mother had said, and that autumn, he sadly left the den of his parents and went out into the big scary world. Zorro spent his first day away from home in a dry cave. His pointy triangular ears were very sensitive and as a result, he was able to hear and hunt a few small rodents and birds. The second day he spent in a log. With his keen sense of smell, he was able to sniff out small mammals like voles and dig into the ground to find them. Fox are important to the ecosystem because they keep the populations of small rodents in check. Zorro was always alert when hunting because he could easily be attacked by wolves, coyotes and bears. Winter was fast approaching and it quickly became cold and windy. Luckily, Zorro was able to find a dry abandoned woodchuck's burrow and he stayed there safely for the rest of winter. One night that spring, Zorro was trotting along merrily when he encountered human civilization! It was a city! Zorro decided to live in the city. However, his sleeping habits changed because of the fluorescent lights and presence of humans; now he woke up later and became nocturnal, or most awake at night time. One night, Zorro was ambling down a narrow alley when all of a sudden, in the flickering yellow light of a streetlamp, a dark furry chubby masked animal jumped out from behind a garbage can. "Ah!" yelled Zorro, startled. He and the mysterious character looked at each other. "What is your name? What *are* you?" they asked at the exact same time. "My name is Zorro! I am a red fox!" said Zorro. "My name is Rusty, and I am a raccoon!" chirped Rusty. "Where are you from? I have never seen you before!" "I am from Canada! I am a Canadian fox!" Zorro replied. "Oh, I have family in Canada!" exclaimed Rusty happily. "Where are you from?" asked Zorro. "I am from here in Michigan." "Oh! I have relatives in the United States!" "Do you want to be my friend?" they asked each other at the same time. Zorro had found his first friend. Now they do everything together. In this treehouse, Grade 6 students can learn about the life of wild red fox and how they are able to adapt to their environment, be it natural or artificial. There is information on the physical description, feeding habits and life cycle of the red fox, as well as their habitat and distribution in North America. As well, fox share the same ecological niche with raccoons, which is exemplified in this creative-writing story where the main character, Zorro the red fox, meets Rusty the raccoon. Red Fox (Vulpes vulpes) This is a great website for background information about the red fox, including description and life cycle, habitats and diseases. The Red Foxes of British Columbia, Canada A brief fieldguide on the identification of the red fox. Red Fox A good website with reliable information about the feeding habits, adaptation to its environment and behavior. Red Fox A very thorough website containing information from an amalgamation of sources, including a dictionary definition, physical description, habitat and distribution and much more.